In March, Rachel Maddow quickly built up an unprecedented level of hype for an MSNBC show by teasing that she had obtained Donald Trump’s tax returns. It later turned out that she had one page from his taxes in 2005, but while the “reveal” was widely derided, it did give Maddow a huge ratings boost. Tonight, Maddow teased another big scoop for her show, referring to it as a “strange exclusive,” but this one might actually be a much bigger deal than that page of Trump’s taxes. 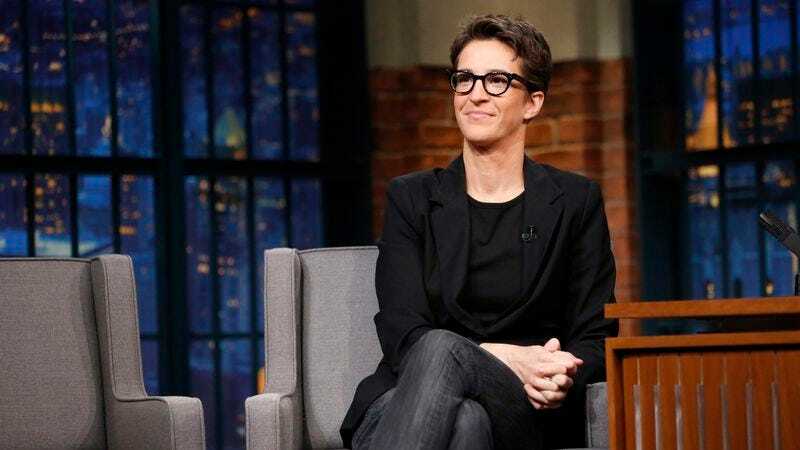 Maddow opened her show by revealing that her anonymous tip-line had recently received a document so explosive that she didn’t feel comfortable revealing any specifics from it, claiming only that it involved possible collusion between Russia and Trump’s presidential campaign. However, Maddow believes that the information contained in the document is irrelevant, because it seems to be a very elaborate and well-made forgery. Her team determined that the document was fake by looking at the recent scandal involving an NSA contractor who was arrested for allegedly leaking documents about Trump and Russia to The Intercept, with the arrest apparently coming from a “thumbprint” that printers leave on paper and a “crease” that the NSA contractor supposedly made after printing out the leaked Intercept documents. According to Maddow, her document had a suspiciously similar “thumbprint” and a crease mark, leading her and her team to guess that it was made by physically copy-and-pasting things from the Intercept leak. The bizarre twist here, though, is that the metadata from Maddow’s document seems to indicate that it was made right after The Intercept obtained its document, meaning Maddow’s might have been made by someone who knew The Intercept was going to publish its document before it happened. Unlike with the tax document, though, Maddow did a good job of explaining why this is a big deal beyond someone trying to pull one over on the American people. Basically, it all goes back to Dan Rather, who destroyed his storied journalistic career by reporting on George W. Bush’s National Guard service (or lack thereof) using questionable sources. As Maddow explained, that controversy added an unshakeable fog to any talk about Bush’s time in the National Guard, so if something similar happened with Trump/Russia—like, say, Rachel Maddow reporting on a fake document as if it were real—it could color the public’s perception of any subsequent Trump/Russia stories and take down a high-profile figure in the press. In other words, there’s a chance someone is trying to plant actual “Fake News” to try and prove that the media is corrupt and biased against Trump. There’s no hard evidence here beyond the existence of Maddow’s fake document, but as she suggested in the segment, it’s something to keep in mind.